American Gold Eagle coins are among the most diverse and popular coins in the world today. Available in bullion, proof, and burnished versions, investors and collectors alike will find plentiful options with 1 oz, ½ oz, ¼ oz, and 1/10 oz coins struck in this program. 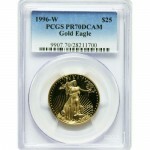 Right now, the 1995-W ¼ oz Proof American Gold Eagle coin is available as perfect specimen on Silver.com. There are 562 coins available in this grade and condition! 10th Anniversary of the American Eagle coin series! Bears a face value of $10 (USD) backed by the federal government. Includes the “W” mint mark of the West Point Mint. Although not the exact 10th anniversary of the American Eagle’s introduction in 1986, the year 1995 did represent the 10th annual release of the coins (1986-1995). The United States Mint celebrated with the release of a 10th Anniversary American Eagle 5-Coin Set. Included in this set was one of each of the four Proof American Gold Eagle coins produced by the West Point Mint. In addition to those coins, which included 1995-W ¼ oz Proof American Gold Eagles, a special 1995-W American Silver Eagle proof was also struck. This coin was the unique one in the group as Proof American Silver Eagle coins at this time were struck at the Philadelphia Mint. Production of Proof American Gold Eagle coins in 1995 was actually down just slight across three of the four available weights. The only version to post a gain in mintage was the ½ oz Proof American Gold Eagle. On the obverse of all American Gold Eagle coins is Augustus Saint-Gaudens’ iconic Liberty design from 1907. The reverse features Miley Busiek’s family of nesting bald eagles, an image which is exclusive to this coin program. 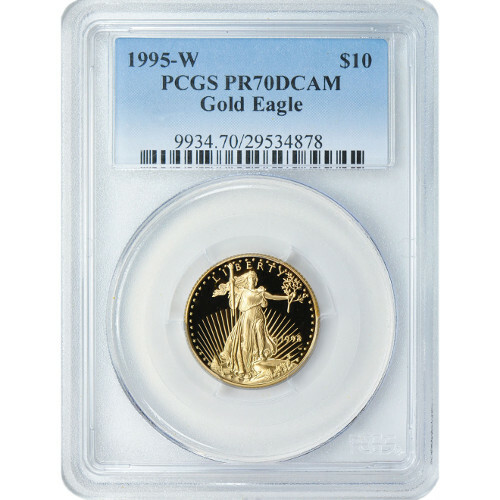 Each Proof American Gold Eagle in this product listing earned a perfect PR70 score from the PCGS. This grade is reserved for coins with full, original mint luster and no detracting flaws. The DCAM designation identifies the coin as one with a strong, frosted matte finish on the design set and a deeply-mirrored, clear background field. The two combine to create stark contrast between the fields and make the Liberty image appear to float above the coin’s surface. Please direct your questions to a Silver.com associate at 800-276-6508. You can also reach us online using our live web chat and email features.